It was that time of the year when Canada comes together to celebrate the courage and indefatigable spirit of the daughters of Middle East. 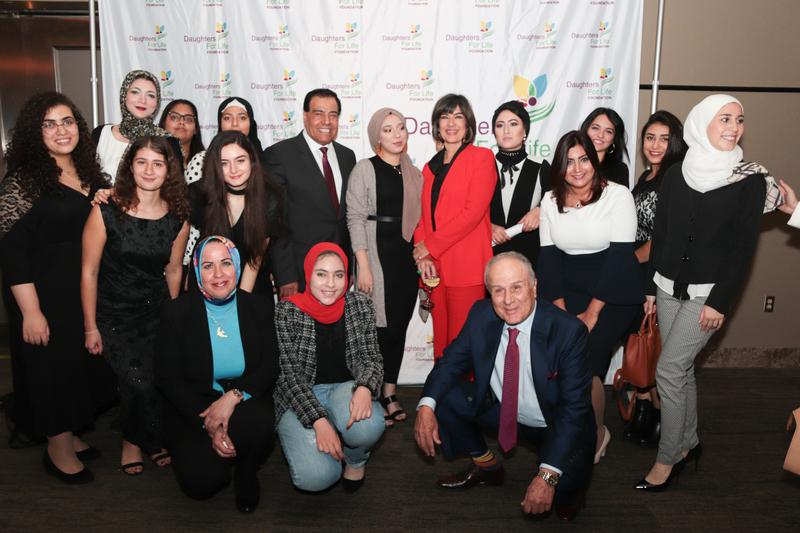 Educational charity Daughters for Life Foundation hosted its 6th annual gala dinner on October 30, 2018, to honour the achievements of all the young women whose lives have found new meaning with the gift of education. 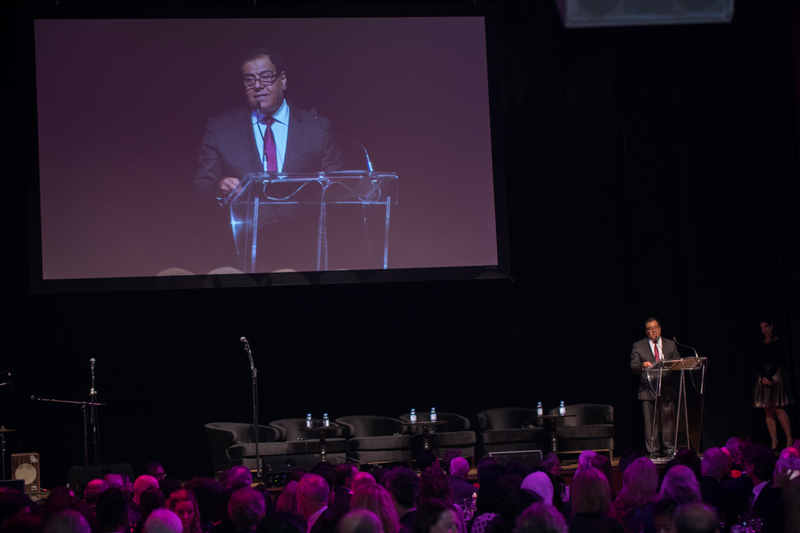 At the elegant Carlu in downtown Toronto, over 400 guests from top universities, and business houses in Canada, cultural and political leaders, artists, and scientists gathered to toast the evening to the inspirational scholars of the Daughters for Life Foundation (DFL). Honorary chair Dr. Roberta Bondar, who is Canada’s first female astronaut and the first neurologist to enter space, graced the gala dinner. Another notable attendees were Leslie Lewis Dan, CM OOnt, the Canadian businessman and a pharmacist and the founder of the CANMAP – Canadian Medicine Aid Program and the MP Majid Jowhari, who represents the riding of Richmond Hill in the House of Commons of Canada. Every year at the gala, the Daughters for Life Luminary Awards are presented. 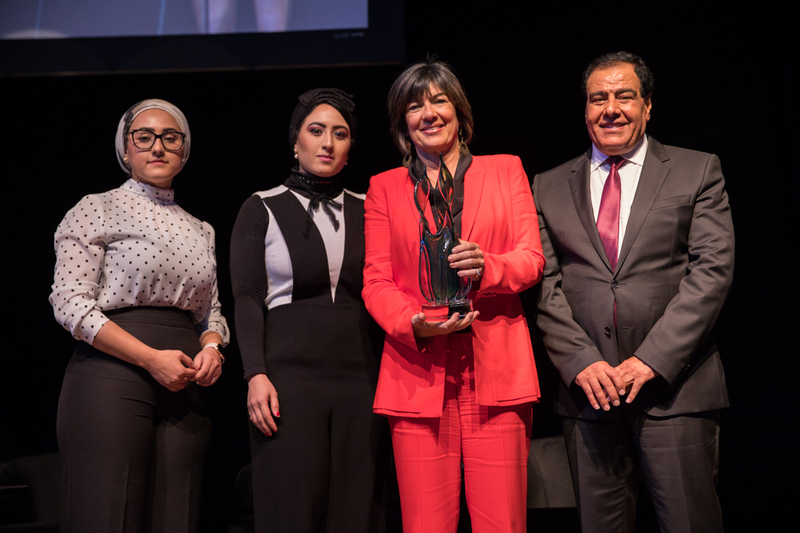 This year, journalism icon Christiane Amanpour was given the Lifetime Achievement Luminary Award. 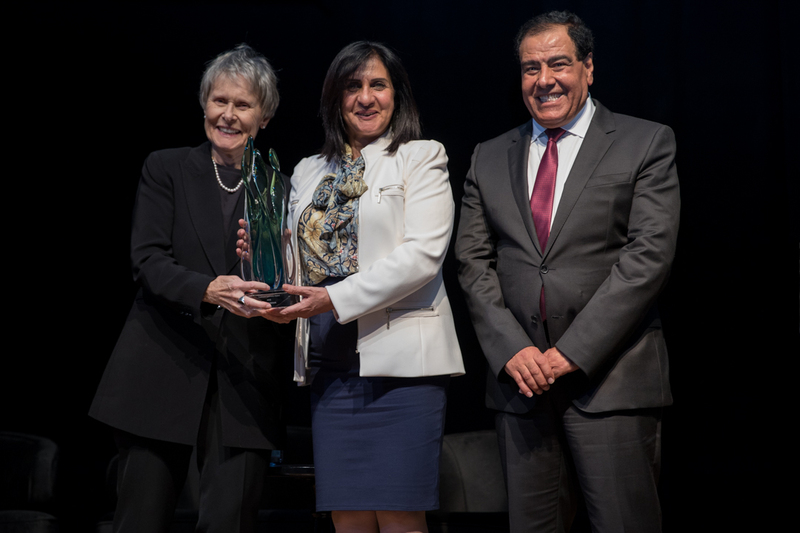 The first female mayor of Bethlehem, Vera Baboun was presented the Trailblazer Luminary Award. 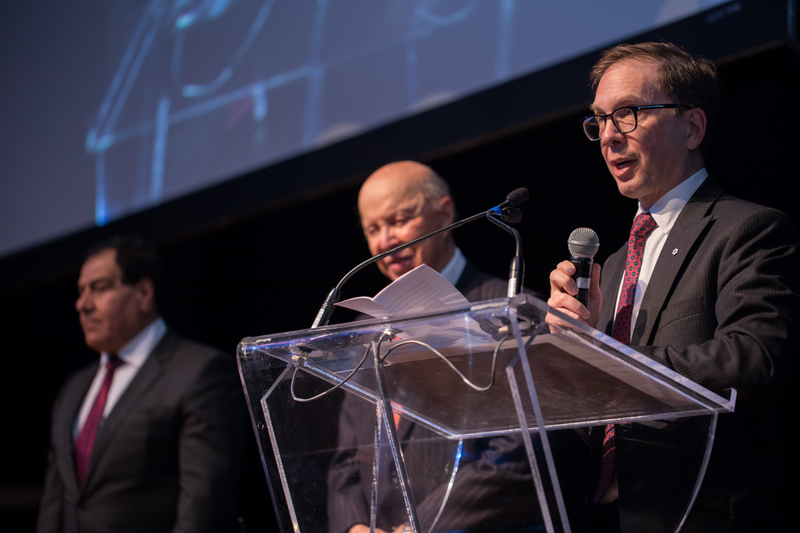 And the leadership Luminary Award went to former neurosurgeon and philanthropist, Dr. Michael Dan. Dressed in their finest, guests were welcomed to a cocktail reception with hors d’oeuvres and a live painting demonstration by visual artist Mike Hammer. Beaming with pride, Dr. Izzeldin Abuelaish, the founder of the Daughters for Life Foundation thanked and welcomed everyone personally. Guests were invited to participate in a raffle with the prize being six passes to a delicious meal at Oliver and Bonacini. The painting by Mike Hammer was also put up for auction. The cocktail reception had a festive ambience as the night’s honoured guests, this year’s Luminary Award recipients – Christiane Amanpour, Vera Baboun and Dr. Michael Dan, the foundation’s scholars, and invitees mingled and captured the occasion on the lenses of the many photographers. 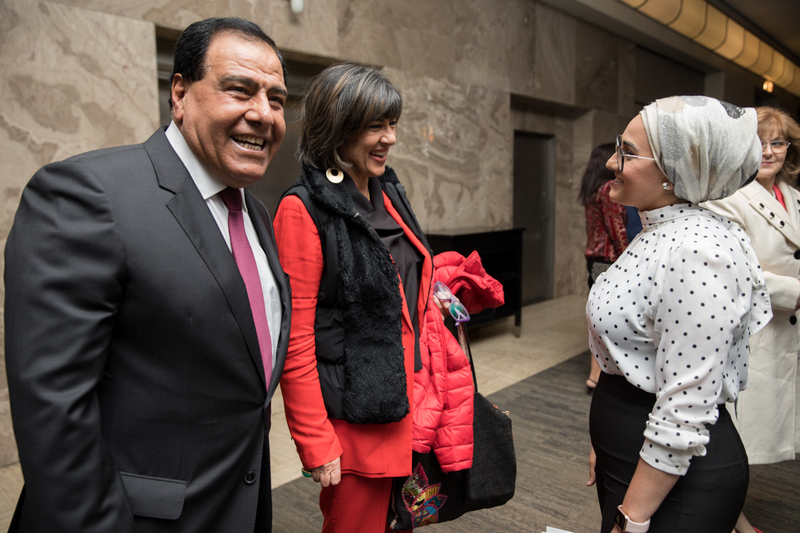 The fanfare for Christiane Amanpour was euphoric as she gracefully shook hands with eager guests and posed for countless photos. 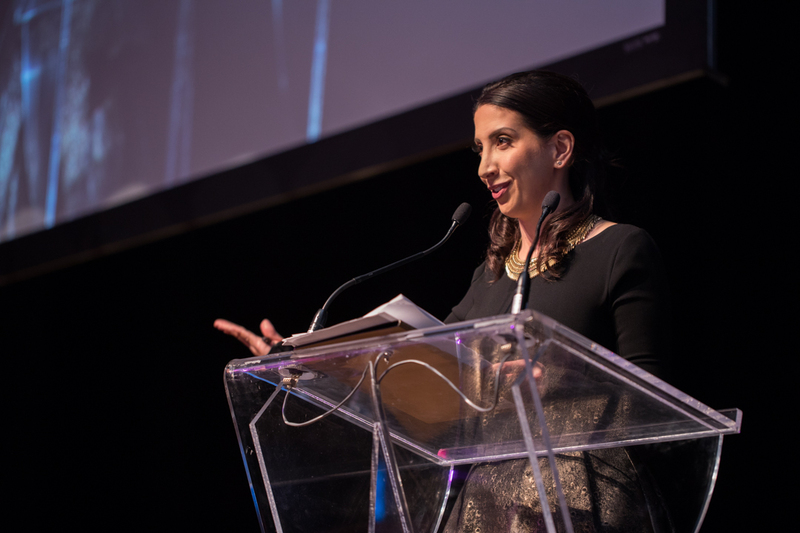 The Master of Ceremonies of the gala dinner was CP24’s reputed reporter and host, Cristina Tenaglia. She opened the evening by paying respects to the sacred land of the First Nations on whose traditional territory the gala was being held. As the gala commenced, Dr. Abuelaish was called on stage to take us back to the moment of inception of the Daughters for Life Foundation. Dr. Abuelaish began his remarks by condemning the recent Pittsburgh synagogue attack and offering his condolences to the innocent lives lost in the mass shooting. “We bleed the same colour. We are all similar and equal. There is no reason to justify killing of human beings. In saving one, we save the world. It is time to speak out and condemn such brutal acts because of manmade hatred and political hate mongering,” said Dr. Abuelaish. 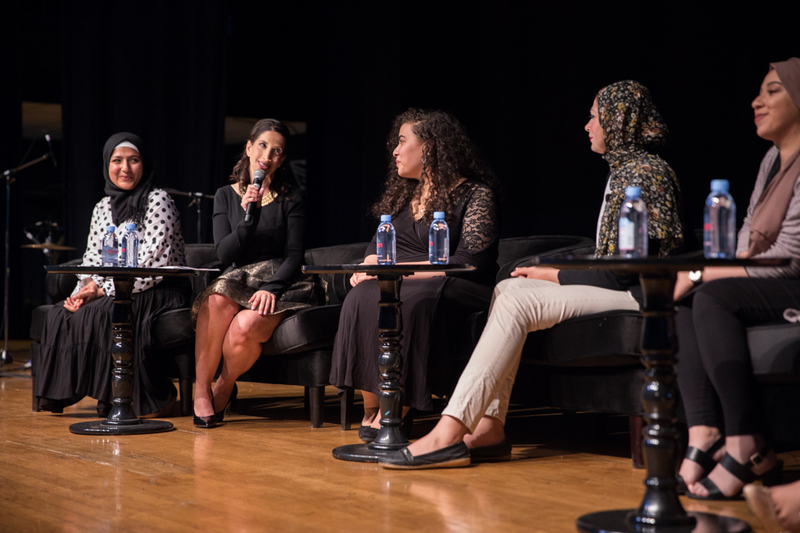 “Daughters for Life believes that the antidote for hatred is education. Tragedy can’t be the end of our lives. We must not allow it to control or defeat us,” he added. The Daughters for Life Foundation was established in 2010 in memory of Bessan, 20, Mayar, 15, and Aya, 13, Dr. Abuelaish’s three daughters, who were killed when an Israeli tank shelled their home in Gaza. 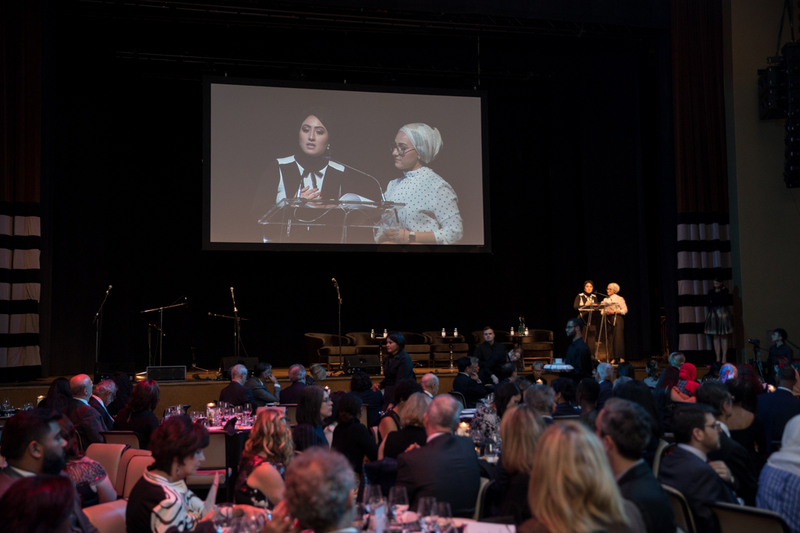 The foundation honours their love for life and learning by awarding educational scholarships to talented young women from the Middle East regardless of their ethnicity. Since its establishment in 2010, Daughters for Life has impacted the lives of 55 scholars, 341 awardees and 5 fellows. After that rousing speech, it was time to spotlight our Daughters for Life scholars. Fourteen of our talented scholars from Canada and the U.S. were present at the gala. A few of them joined the MC on stage to take us through their incredible journey of fighting discrimination, poverty, and violence to make their way to the top universities in the world with their sheer talent and grit. 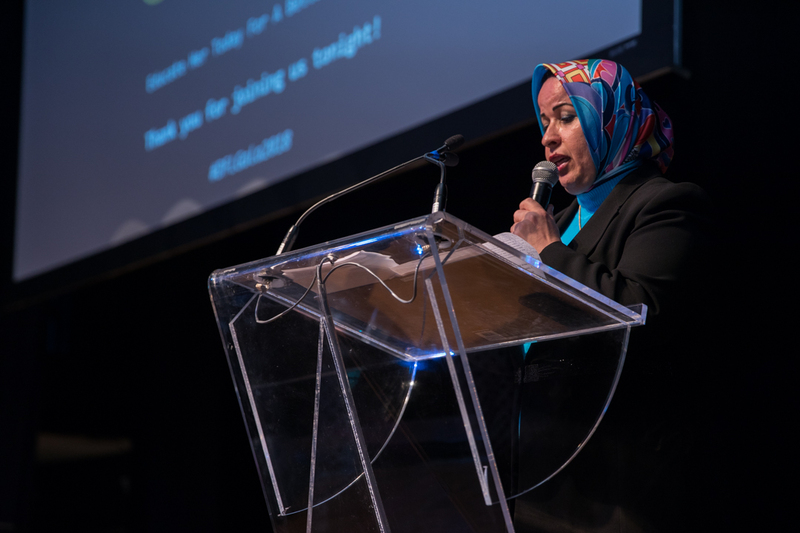 Maha Mehanna, a master’s degree Student studying Peace Studies and Conflict Resolution at our partner Eastern Mennonite University in the U.S. received a standing ovation as she described the many odds that she overcame living in the open-air prison that she calls the Gaza strip. 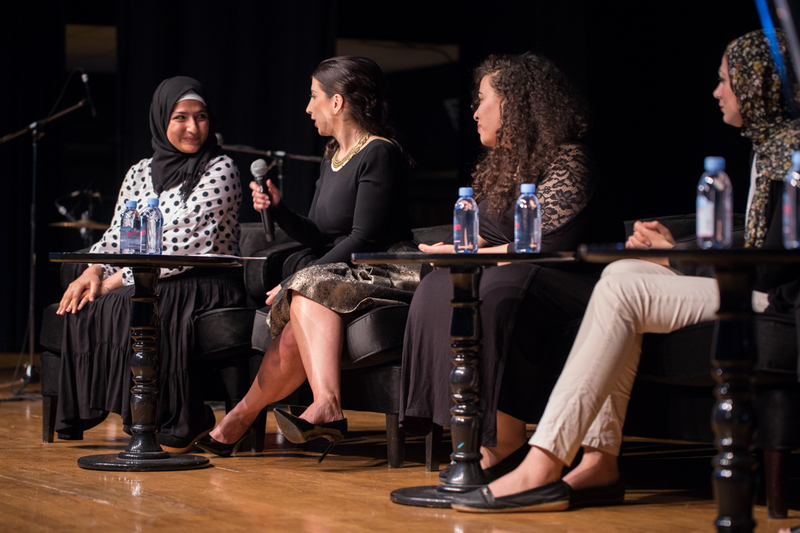 Maha said her dream was to improve the lives of women and girls in Palestine. Esraa Naguib, who hails from Egypt, is today studying Foods and Nutritional Sciences at Brescia University College. She had the audience in rapt attention as she described her ambition to improve nutrition standards in Egypt to eradicate diseases. She urged women to stand up for their rights in the Middle East. The ever-cheerful Sahar Al Ahmad left war-torn Syria in 2014. The brave young woman brushed off that tough period with a smile as she described her journey from being a refugee in Turkey to becoming a DFL scholar at Windsor University’s Environmental Engineering program. Sahar has amazed the foundation and her sponsors as she worked hard to improve her English score and earn an admission into her dream college. “I want to rebuild Syria. After what we lost, we need to stand with our country,” said Sahar. 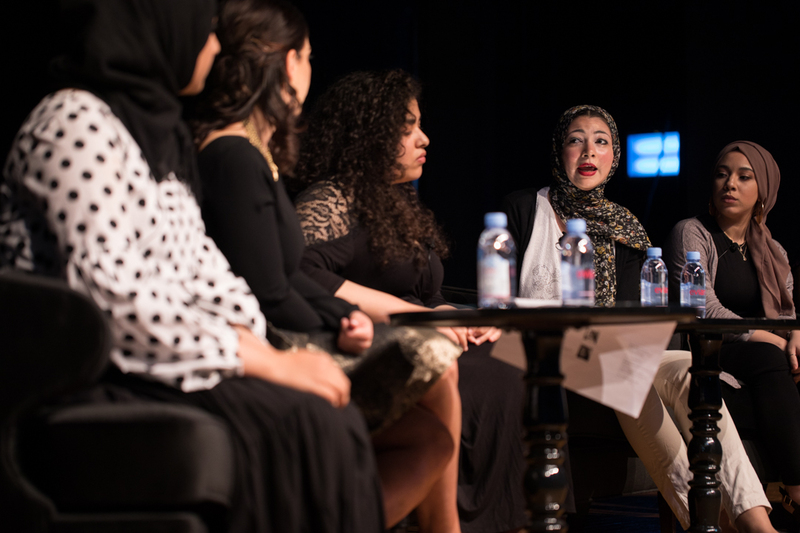 English Literature and Creative Writing student Waad Hassan from Lebanon told the audience that she wants to become a teacher to empower others to share their stories. “Education is the only weapon you have to face any difficulties in life,” said the fourth-year undergraduate student. Morocco’s Safaa Zaoui, a second-year undergraduate student of Computer Engineering at College Boreal said she is determined to become a computer programmer and feels especially motivated when she is told women can’t become programmers. Egypt’s Passant Metwally is also studying computer engineering at Toronto’s York University. Passant said she is enjoying the entrepreneurship and business lessons she is receiving alongside her computer engineering program. Born with a speech disorder that makes her stutter, Passant used the moment and the platform to share with guests her personal story. The self-assured and eloquent Passant showed the courage to speak about her speech impairment, stating that stuttering was a factor of biology and not a lack of confidence. She said Dr. Abuelaish and the foundation saw a spark in her and gave wings to her dreams. Passant said she was encouraged by DFL to believe in herself and stay true to her vision of herself as a modern-day technology professional. The heart-warming conversations with the DFL scholars was followed by the entertainment of the evening. 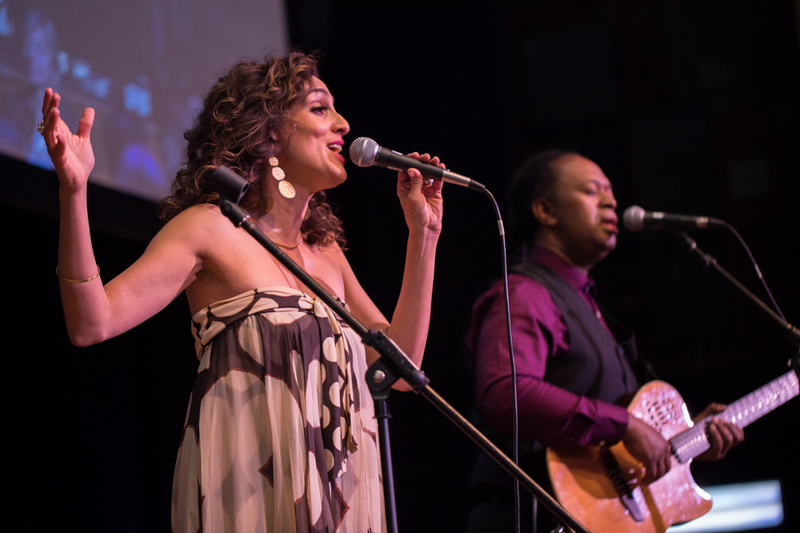 Canadian singer, songwriter Amanda Martinez performed her joyous Latin jazz tunes as guests enjoyed a delectable dinner service. She was accompanied by guitarist Kevin Laliberté, Donné Roberts also on the guitar and vocals, and Percussionist Rosendo Chendy Leon. 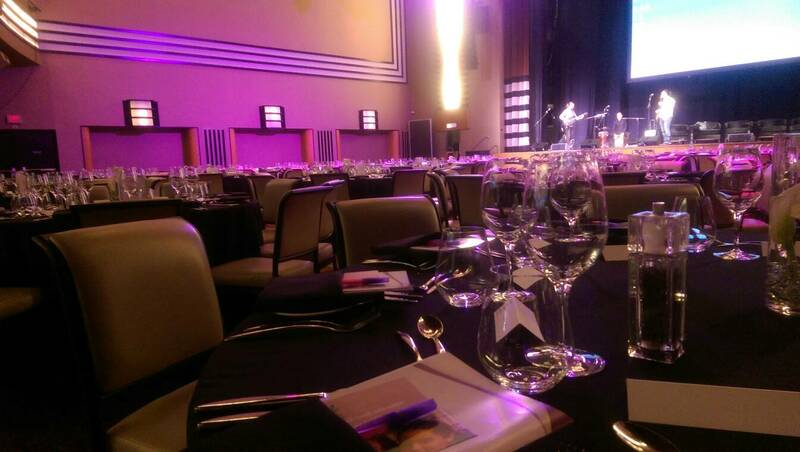 Soon it was time for that part of the evening when the Luminary Awards were to be presented. 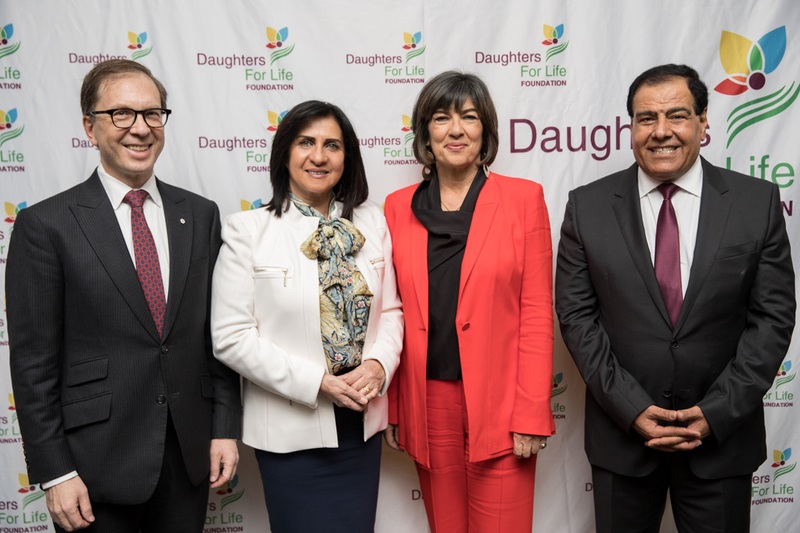 For her significant work on gender issues, empowering women in the Arab world, and promoting their professional advancement – the first mayor of the city of Bethlehem – Vera Baboun was honoured with the Daughters for Life Trailblazer Luminary Award. The evening progressed to the next honour of the night. The Daughters for Life Leadership Luminary Award was presented to Dr. Michael Dan, a leading philanthropist and a former neurosurgeon who is also the co-founding member of the foundation. Dr. Dan is dedicated to human rights, peace in the Middle East, and First Nations initiatives. “Educating women and girls is a powerful public health intervention. Educated women raise smaller families and provide better for their families and communities. 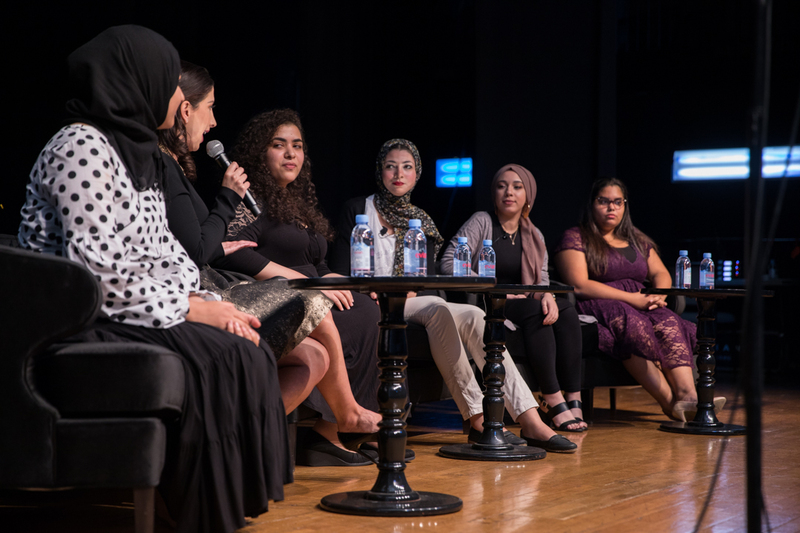 I am confident that our Daughters for Life scholars will one day have a huge impact throughout the Middle East and beyond as teachers, role models, leaders, and others. They will be engines of social progress and enlightenment. Eventually, it can even reach a tipping point. And the values of tolerance and inclusion will once again spread out from the Middle East towards the rest of the world as they did so powerfully 2000 years ago,” said Dr. Michael Dan. After receiving the award, Christane Amanpour spoke at length with the audience. She recalled the moment when she came across Dr. Abuelaish’s family story in 2009 and visited his tank-shelled apartment in Gaza as a journalist. After the raffle winner was announced, it was time to bring the curtains down on a beautiful night of inspiration and empowerment. 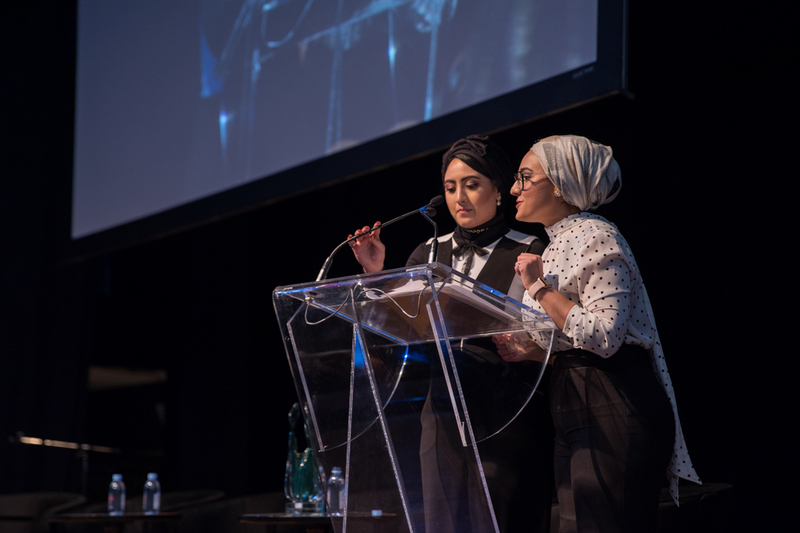 Gala chairs, Shatha Abuelaish and Dalal Abuelaish, read the closing remarks and thanked all members of the gala organizing committee, silver sponsors, in-kind sponsors, academic partners, volunteers, and DFL’s sole employee Jacklin Ibrahim for the untiring work and continued support they put in to achieve the foundation’s mission of promoting peace through the education of girls in the Middle East.